Many have been asking: well here's the answer! A Late Freeze by Danica Novgorodoff is now available for purchase at her website. The problem with the youth of today' is that one is no longer part of it. Since my esteemed editor Mr Siegel is more likely to use my blog entries if I include a picture with my words, here's a quick scribble of Dali. BOOKLIST spills over with FIRST SECOND! Guess who's on the cover of BOOKLIST? That's not all, either: :01 seems to be haunting this whole issue! Between the reviews, our ads, and a couple feature pieces (including an interview of yours truly bloggily), this all adds to our pre-launch with a mighty buzz. 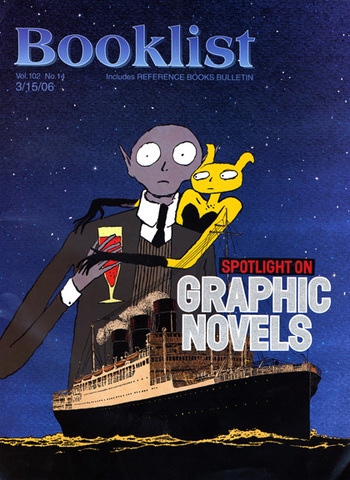 BOOKLIST is the reference magazine for the American Library Association. Among the flotsam and jetsam of today's egosurfing, the author comes across a short session filmed at the last San diego con. Or do we say 'taped' still? The author has no idea about the technical processes. In fact he can't figure out how to get a look at the thing. Do us a favor, check it out and if he look like a twerp, let us know so we can remove this link. 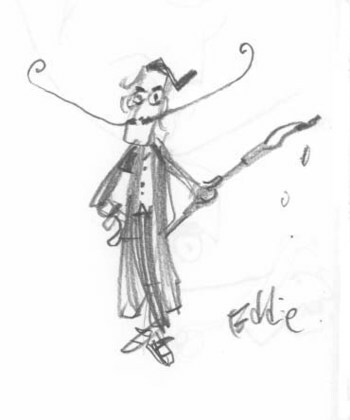 Writer and artist Eddie Campbell talks about The Fate of the Artist. Two kids got on the bus and sat behind me. They started talking about someone called Felicity. Felicity could have been a friend or someone they hated, for all I knew. I couldn't tell the difference. 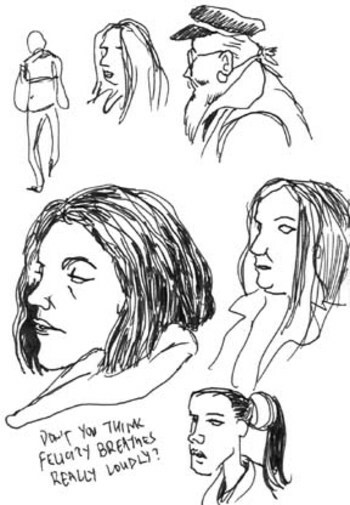 At first, I thought it might've been the rather lanky ponytailed girl who sat across from me (pictured). But I slowly realized Felicity wasn't present. "Don't you think Felicity breathes really loudly?" one of them ventured. There was agreement, and laughter from both. They got off the bus at the next stop. All I could think was, "Poor Felicity. She might have asthma." Don't miss it! On March 25th, Matt Madden and Jessica Abel are doing a comics jam at the fantastic Rocketship store in Brooklyn, NY. 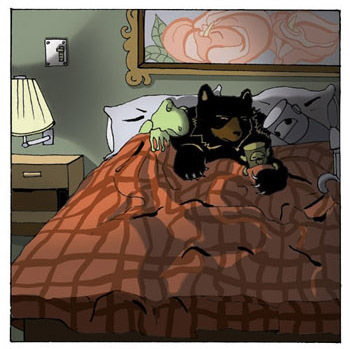 As those of you who've visited regularly know, Danica Novgorodoff, Russian spy and First Second Designer -- is also a talented comics artist. She just self-published her first book A LATE FREEZE! With an art-style somewhere between Chris Ware and Lauren McCubbin – and something that has an amusing eye for detail, as the floating Hanes briefs underwater show – and writing that reminds me of Hope Larson and the Perry Bible Fellowship, this is something that’s well worth looking out for. Excellent. So, Danica, where can someone get their own copy? Our catalog got a review... And a good one, mostly! It's from David Welsh at the PRECOCIOUS CURMUDGEON. Yes, yes, yes, the rumors are true: Paul Pope is working on a massive, epic project for First Second -- in full color and for young readers. 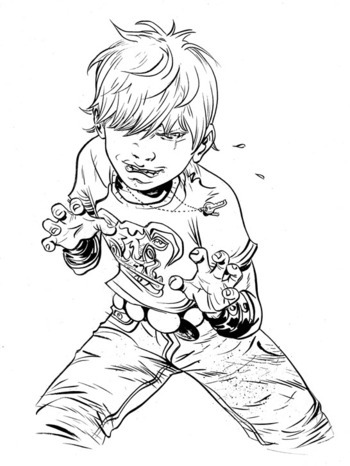 Battling Boy is aimed at kids and it's coming out from First Second in 2007. It's a kind of a fairytale kid Beowulf, or a Peter Pan with teeth. It's set in a mythical city called Monstropolis, a city the size of a continent that's overrun with monsters.